Individual errors cost Peterborough United dearly in their 3-2 defeat to Blackburn Rovers, according to Posh boss Grant McCann. Posh led one-nil at half-time thanks to Steven Taylor’s back-post header from a Marcus Maddison corner, but three goals in the first 13 minutes of the second-half from Charlie Mulgrew and Bradley Dack (who scored twice) put pay to Posh’s chances of a second win in six League One matches. 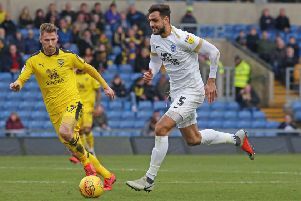 And despite Jack Marriott pulling a goal back with 90 seconds of stoppage time left by tapping in substitute Danny Lloyd’s cross, Posh slipped to a defeat which sees them fall from seventh to 10th in League One. The match also ended on a sour note for the home side with captain Jack Baldwin receiving a second yellow card for a foul on Dack, who was outstanding in the second-half. McCann was left disappointed by Mulgrew’s equaliser - with the free-scoring defender bundling in from a corner - as well as Dack’s two goals. For the first Dack goal Chris Forrester lost possession, while his second came from a rapid counter-attack after Steven Taylor lost the ball in Blackburn’s corner flag. Rovers broke at speed, evading Jack Baldwin before Dack was picked out to finish impressively past Bond. McCann said: “There are a lot of positives to take out of the performance. In the first-half and the way we finished the game - if we’re going to lose games that’s the way to lose them. “At least we were having a go, but it was a little bit too late really. “But credit to the boys they kept going. It was a good goal right at the death, it just came too late. “I thought there were more than five minutes of injury time. There must have been at least seven or eight - we were counting them on the side. So I’m disappointed with that. “I was also really, really disappointed from half-time onwards. Three individual mistakes have cost us the game. We’ve given Blackburn the win. “My centre-half loses his man from a corner, my midfielder overplays and has the ball taken from him, and Tayls (Steven Taylor) has the ball in the corner, it comes to Jack Baldwin and he should just help it back in and he doesn’t and they break on us. McCann hailed the impact substitutes Lloyd and Michael Doughty made after coming on, although he said it was only the second time this season where he could remember his substitutes having an effect on the match. He said: “It was two good teams going hell to leather. Unfortunately we’ve come out the wrong side of it, but I was more pleased with the response of the boys - we kept going. “I think the two subs for probably the first time this season - except maybe the Walsall game - have come on and affected the game for us. “Except for Junior (Morias) coming on at Walsall and getting a winner which was disallowed, I can’t remember the last time a sub came on and made an impact for us which is really, really disappointing. With less than a month until the January transfer window, McCann also warned his players that they could be sold if they fail to attack enough. The Posh boss was annoyed that his players did not have more of a go at Blackburn, especially after taking the lead. He added: “I said to the boys afterwards, the DNA of this football club is not to concede and sit back. The DNA since I’ve been playing here is, if you concede, you go and score. “I want brave players here. I don’t want players who are fearful of conceding again. The best form of defence for me is attack. We should have gone and got another goal, but we didn’t. “I was disappointed after we scored in the first-half as for 10 to 15 minutes we sat back, and that’s something the players need to realise because if they want to play like that then they may as well go to a team that’s defensive, one of the teams in the lower half of the league who want to get a one-nil lead and sit back. McCann said he did not see Baldwin’s first yellow card for bringing down Craig Conway, but that he had no complaints with his second booking. He also gave some reassurance over midfielder Anthony Grant who hobbled off towards the end. A stretcher had been brought out for Grant, but after medical treatment he was able to walk off the pitch. McCann said Grant had received a knock to the head after making a tackle but was fine in the changing room afterwards. Leo Da Silva Lopes did not make the squad for the match with a hamstring injury, but McCann said he will be completely fine next week.